Four characters struggle to negotiate Iran's strict religious society. The Middle East can prove an inhospitable environment for filmmakers. Just ask Jafar Panahi, who has had to find ingenious ways to skirt a filmmaking ban imposed by the Iranian authorities, or Saudi filmmaker Haifaa al-Mansour, who was forced to direct her debut, Wadjda, via walkie talkie while she hid in the back of a van. Perhaps this is why we've seen so many filmmakers adopt the medium of animation to tell Middle Eastern stories in recent years. 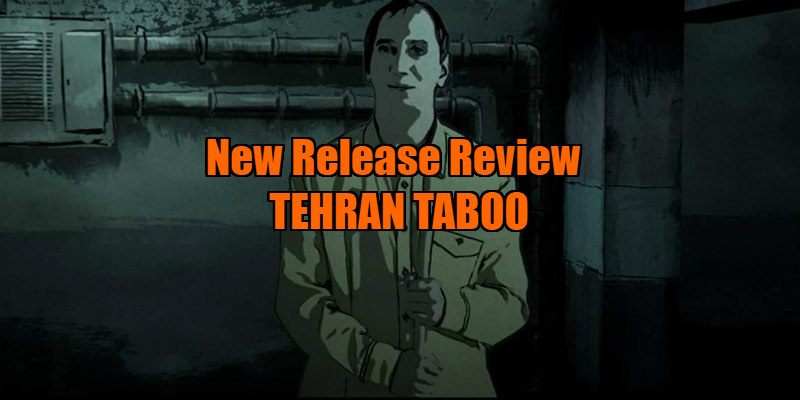 Joining the likes of Persepolis, Waltz with Bashir and The Breadwinner is Ali Soozandeh's Tehran Taboo, a damning look at the inherent misogyny of Iranian society. Soozandeh's film follows four characters. Pari (Elmira Rafizadeh) is a tough-talking prostitute struggling to get her mute son accepted into a school. In an attempt to get a divorce granted from her imprisoned junkie husband, Pari begins sleeping with a judge, who sets her up as his secret mistress in an apartment he owns. There she meets and befriends neighbour Sara (Zahra Amir Ebrahimi), a timid young pregnant woman who begins to come out of her shell in Pari's presence. Meanwhile, music student Babak (Arash Marandi) has a nightclub bathroom encounter with Donya (Negar Mona Alizadeh), who informs him the following morning that she is engaged to be married and needs to somehow recover her virginity before the wedding night. Babak begins a quest to attain the necessary funds to pay for a backstreet operation to restore Donya's hymen. Using the rotoscope method, as seen in Richard Linklater's films A Scanner Darkly and Waking Life, Soozandeh filmed his actors in front of a greenscreen, later building the environments around them. The resulting recreation of the bustling, neon lit streets of Tehran gives the Iranian capital the appearance of some future metropolis from a Japanese sci-fi anime. With police bundling young people into the back of trucks for the mere transgression of holding hands in public, you could be forgiven for believing Tehran Taboo was based on some dystopian Young Adult novel rather than on real life for the citizens of Iran. The use of natural and man-made light is dazzling to look at, and the attention to background detail really immerses you in the story. Soozandeh takes advantage of the animated medium to pull off creative scene transitions that wouldn't be possible in live-action. 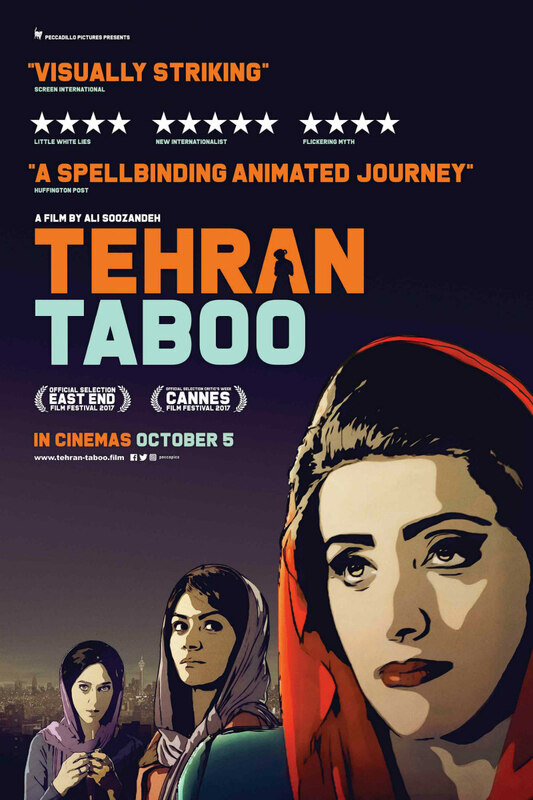 With its ensemble structure, Tehran Taboo owes much to the many multi-narrative movies that became popular in the 1990s in the wake of Short Cuts and Pulp Fiction, but while most of those films struggled to pull off the trick as well as Altman and Tarantino, Soozandeh's film is a drum-tight piece of storytelling. The narrative moves at breakneck pace, its protagonists barely given a chance to breathe as their troubles - most of which are brought on by Iran's nonsensical and misogynistic religious codes - become increasingly suffocating. When the film's three main subplots coalesce, it's in a naturalistic fashion that serves as testament to Soozandeh's immaculate sense of story structure. Tehran Taboo often resembles a hipper, more streetwise cousin of the work of Iran's rebellious filmmaking figurehead, Jafar Panahi. It tells a story that will and should induce outrage from any liberal minded viewer, but it does so in a wry and often witty fashion, and some of the sexual double standards on display are so ludicrous that you simply have to laugh. The film's outlook is personified by the character of Pari, who despite her horrific situation, has found a way to keep smiling in the face of a life no woman should have to endure. Tehran Taboo is in UK cinemas October 5th.